Is it obsessive to, when you are taking a bottle of wine over to a friend’s place, also want to bring a decanter and proper stemware? Come on, you wouldn’t put regular unleaded in a sports car, right? Yes, yes, I know that that analogy is flawed, but you get the idea. Such was the question that plagued me when I was bringing over a bottle of the 2007 St. Innocent “Shea Vineyard” Pinot Noir (from the Willamette Valley, Oregon) ($49.00 at Bell Liquor & Wine Shoppe) for a movie night with a friend. I asked my roommate whether bringing the decanter and some Burgundy glasses would be too much. “Um… yeah,” he replied, looking at me like I was crazy. (Then again, this is the guy who recently ran a 50-mile marathon.) So I decided not to bring the decanter and the wine glasses, even though the Pinot was almost criminally young. It was with some trepidation, therefore, that I opened the bottle and poured some into wine glasses the hostess provided. Some wines are good on their own; others are better with food. With that being said, I can think of no other wine that would be as good with as many different foods as the Shea Vineyard. The nose itself was decent–nothing too aromatic about it. Standard Pinot nose, I suppose, nothing bursting forth from the glass. Berry and a bit of earth. The wine seemed somewhat closed the first few sips but over the course of the evening it opened up. It is a generous wine, very full-flavored and with some terrific acidity. Pepper and a bit of eucalyptus gave way to berries–strawberry or blackberry or both–mixed with earth and leather, then a very tantalizing funk at the finish, like mushroom. The mouthfeel was superb, with a touch of astringency reminiscent of eating a tangy goat cheese. With the mushroom funkiness and the tangy/astringent goat cheese mouthfeel this wine would pair extremely well with any number of French breakfast or brunch options. In fact, aside from certain Cabernet Francs this is probably the BEST wine you could drink with a breakfast, if you’re not fundamentally opposed to drinking wine with breakfast. I could imagine drinking it with a nice mushroom omelet, with a toasted baguette spread with goat cheese, sides of tomatoes prepared Provençal style, with rosemary and thyme and plenty of garlic and olive oil. You could save some of the bottle for lunch: spicy Merguez sausage with white beans, tuna niçoise, grilled salmon, rabbit, hanger steak. This wine would be able to take anything you throw at it. I would like to try this wine again in a few years. I would imagine the earthy notes would deepen and predominate, with the fruit fading a bit. It would be glorious to behold. Is this a great Pinot? At this point, no. It’s not transcendent, but again, few things are when so young. I do certainly like it better than many other Pinots I’ve tried from the US; it’s much more restrained and refined, with a decent 13.5% ABV. Even though it is an excellent wine, it seems a little bit pricey. I would recommend the Elizabeth Spencer “Special Cuvee” from the Central Coast of California, which at $32.99 has a high quality to price ratio. Or, I would recommend spending a little bit more money and getting a great Burgundy. Now if only I were already a lawyer. Your blog looks wonderful. It was nice going through your blog. Keep it up the good work. Thanks so much! I hope to keep posting for a very long time. This is a very expensive US price for the pinot, but I think you simply had it too young. And, yes, force glassware on people. Drinking a wine like this out of crappy glasses is a sin! 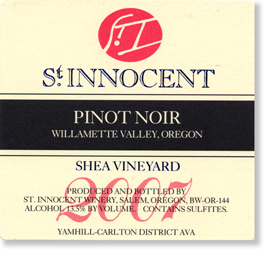 I’ve had the 2006 St. Innocent Shea Vineyard, which was excellent, but 2006 is a much better vintage than 2007. 2007 was a problem vintage as there were heavy rains in Oregon at harvest. I haven’t been into the 07’s I’ve tried. They a bit off-kilter and off-balance, at least right now. Yeah: I would like to say that this was a really great Pinot but I can’t. It was good, better than most other American Pinots I’ve had, but it was lacking that final spark, that “it” factor that elevates good wine to great, and great to extraordinary. I find very few New World pinots achieve that. But, I’m still in the process of finding out. And, I still have a couple more posts to go in my series on new world pinot. So far the best I had was from Sojourn Cellars, making wine in Sonoma Coast.